What were you doing at 4:30 am on Sunday May 21st? 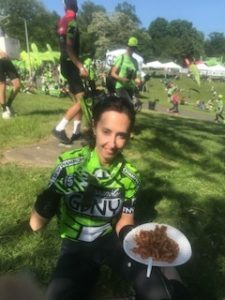 Probably not dragging yourself out of bed and putting on a spandex green outfit to ride 100 miles on your bike with 3900+ other riders! That’s exactly what I did when I participated in the Gran Fondo New York (GFNY) bike race. Read on to hear about my grueling experience … and get ready for A LOT of green pictures. I’ve been into cycling for the past 15 years or so and can be found most Sundays (weather permitting) on my bike in the hills of NJ or upstate NY – typically riding 50 miles or so. I also try to get in a 20 mile ride in Central Park (or a spin class) once a week. There is something very freeing about biking – maybe the wind in my face, the speed or just getting out of the cement city. 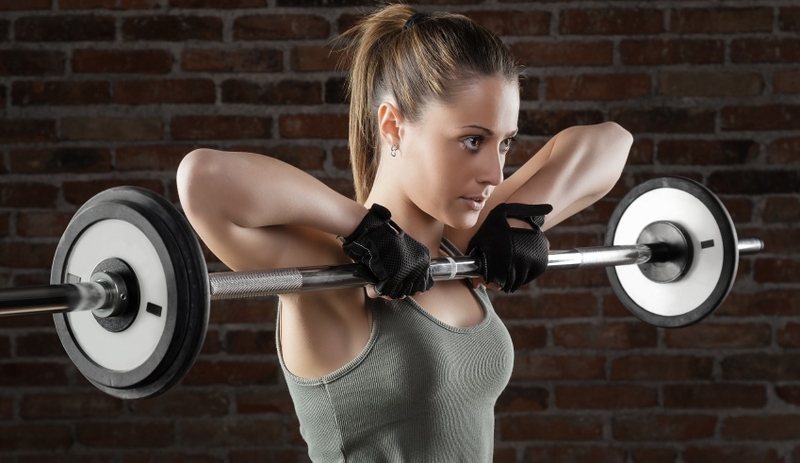 It’s an activity not just a workout … but it definitely is a workout too. Let’s just say biking for 4 hours outside is not the same as a spin class! I had done the Gran Fondo New York 2012, but hadn’t done it since, mainly because I was working too much, had minimal time to train and we had some bad winters weather-wise (and lack of motivation!) The race is held in May so it doesn’t give you much time to train if we have a cold snowy winter. But I do love physical challenges … so when I started getting promotional emails about the GFNY in January, I entered into the “contemplation” phase about doing it again. So what’s the Gran Fondo? The picture below shows the elevation of the course. See the website for a better view and more details. This year my work schedule loosened up a bit, so I was in “contemplation” mode up until March. In April I bit the bullet and plunked down the hefty registration fee (~ $350) signaling my 100% commitment. Note: the registration fee is as low as $199 if you sign up in advance! The entrance fee may be higher than other events due to the high cost of putting on the race (over $700,000 for closures and police alone). 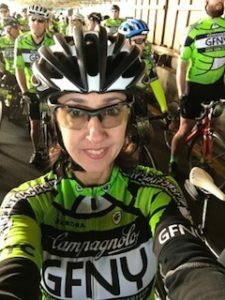 – I would get a unique green cycling GFNY jersey to match new my black/green Pinarello Dogma bike (bought at Strictly Bicycles in NJ)! 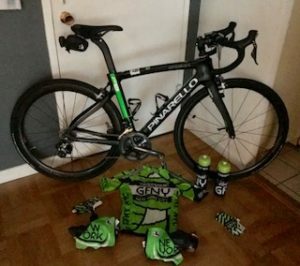 This fits in line with my obsession with green and black cycling gear (I must have 6 green/black cycling tops as well as matching socks, gloves, booties that cover your shoes, water bottles, etc) see pic – notice my little green booties, green gloves and green/black water bottles! 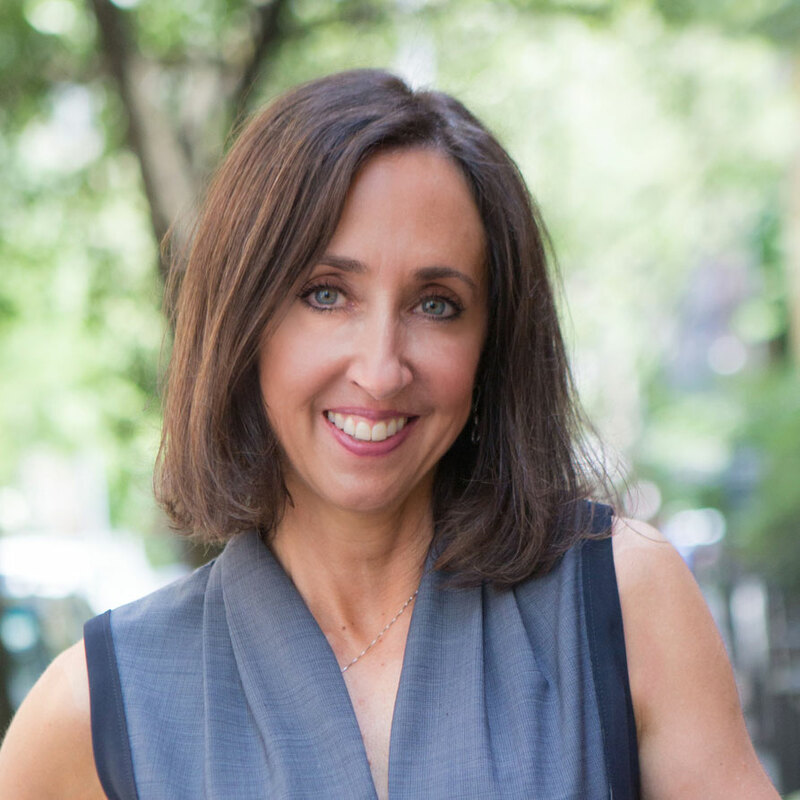 In general, I tend to workout 5 days a week – biking 2 days a week + weight training or yoga 3 days a week. 6-8 weeks prior to the race, I focused mainly on biking (averaging biking 2-3 x/wk) and stopped weight training legs (but continued yoga + upper body weight training). On Sundays, we did rides from 45-65 miles and tried to incorporate some of the hills of the course. For some reason, I was not recovering well after the long rides and my legs felt more tired than usual. This affected my training and motivation to train more! I also ate more carbs during these 8 weeks. My usual diet is moderately low in carbs, but during these 8 weeks, I made myself eat more carbs. While I am a positive person, I’ll start with the negative! -Hadn’t trained enough. I found my training log from 2012 and this year I did significantly less riding this year. 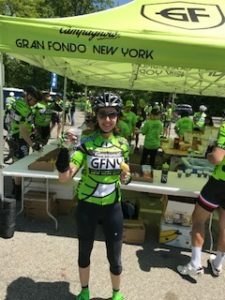 Most of the training plans for the GFNY recommended riding 5 days a week. -Don’t like a lot of riders around me when biking. I get nervous thinking someone will fall in front of me/hit me from behind or cut me off. -Weather. Rain was predicted to start late that afternoon. I would not do the ride if it was raining. The day started at 4:30 am (got a whopping 4 hour of broken sleep according to my fitbit!) Ate 2 bananas and a Greek yogurt. Called a car service ($60) to transport me and my bike to the start line (only 8 miles away but I wasn’t thrilled with the idea of biking at 5:30 am in my semi-comatose state). 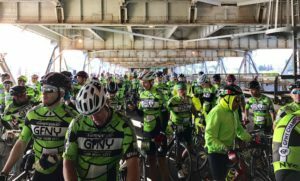 We had to be on the GW Bridge by 6:15 am and then waited 45 minutes until the ride started after the National Anthem … and then the mass start of 3900+ riders (not bad for a claustrophobic person who was once terrified of bridges!) My tactic was to put as minimal effort into riding until I got to Piermont, so I rode very slow. While much of this part of the race was flat, there were definitely a few significant hills on the way – including the 1 mile hill on Alpine (average 7.4% grade). There were plenty of hills on the way to the first major hill – the 4 mile Bear Mountain climb (average grade 5.1, max 10.4). I felt really good going up Bear Mountain. I pushed myself a lot (and came in 1344 out of 2705 men and women … which I was happy with!) It was a beautiful sunny day with perfect riding temperatures. The crowd of riders thinned out so I wasn’t that “claustrophobic” and didn’t feel the pressure to go faster than I wanted to down hills. I held my own and felt pretty good until about mile 90. Those last 10 miles were torture and I really wanted to get off the bike ASAP. I also had about 1/3 bottle of 5 Hour Energy at mile 75 and started to feel really weird due to the caffeine (or maybe I was delirious from biking for 7 hours??) The final torture came at mile 97 where where was a one mile hill with an average grade of 6% (max 10). Not what you want at that point. Many people had gotten off their bikes and were walking at that point. Not me! We stopped at 4 of the 5 rest stops (mile 32, 45, 68, 80) to use the bathroom, get snacks and fill up with water. My goal was to drink ~ 20 oz of water and consume ~ 250 calories an hour. I believe I consumed 3 power gels, about 2 bagels with peanut butter, 2 bananas, ~ 10 oz of coke (I NEVER drink soda …. but it tasted amazing at mile 80!) then the “big meal” at the end of the race – a large plate of pasta. But the eating continued when I got home when my appetite kicked into full gear – a large slice of pizza and jumbo salad with chicken. It was TOUGH! I don’t remember my legs feeling so tired 5 years ago. I refuse to accept that my older age was the cause … I feel it was from inadequate training. The whole ride took me over 8 hours. While my total time was quite slow, I am proud that I did so well on the Bear Mountain Hill. In addition, I did it for the enjoyment of the day, not to “race”! The race was very well run, the rest stops were stocked with a variety of food, the weather was perfect and there were plenty of porto potties. The festivities at the end were fun and the pasta was delicious! For someone obsessed with green cycling shirts, it’s always a pleasure to see 3900+ riders wearing my favorite color. I also loved seeing cyclists of so many different levels ride the same course. While some people struggled to get up the hills, they didn’t give up. I’d highly recommend this race to any cycling enthusiasts who want to experience a great day of cycling as well as a “personal challenge”. 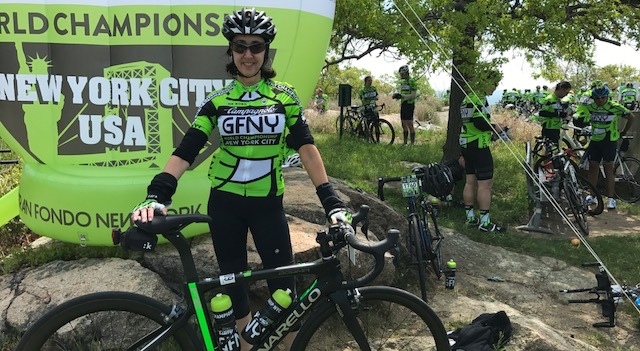 Thank you to the organizers of GFNY for putting such a great event together as well as the policeman, volunteers and spectators cheering us on. In summary, I would highly encourage all of you CGB readers to consider signing up for a physical challenge – whether it be a 5K race, a mud run, a triathalon, bootcamp class or charity walk/ride/run. 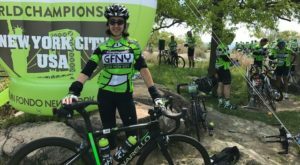 Some of you may even want to train for the GFNY (100 or 50 mile race) next year. You might see me there again!